Parties! 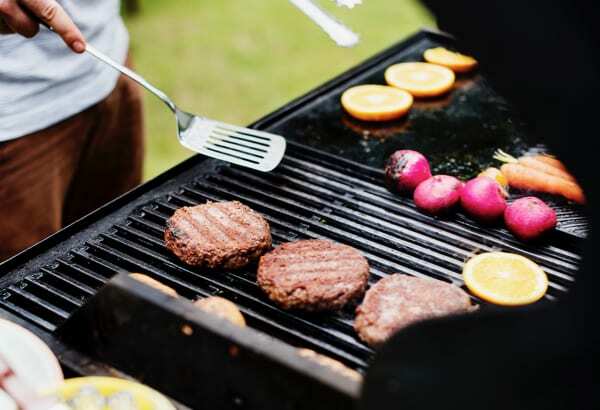 Doesn't matter what type of party – birthdays, park dates, graduations, family reunions, barbecues, church activities, sleepovers, weddings… Where there's a party, there must be food! Today we're sharing some of our favorite cheap party food ideas! Whether the party is big or small, we all know that people gather together where there is good food. No matter the size or style of your party, I'm sharing all the tips for planning and prepping an amazing party for cheap! Not only that, we have an amazing list of party food ideas to help you figure out exactly what to serve! If you know me, you know I love to party! I am an entertaining NUT. We love having people over, whether it's one couple or forty friends – we love to entertain. A LOT. Unfortunately, if you're not careful, feeding a crowd can be expensive! Don't worry, my friend, I've got some tips to help you stay on top of your party budget! Plan Your Menu – Check out this section to learn about all the factors you should consider before planning your menu for your upcoming party. 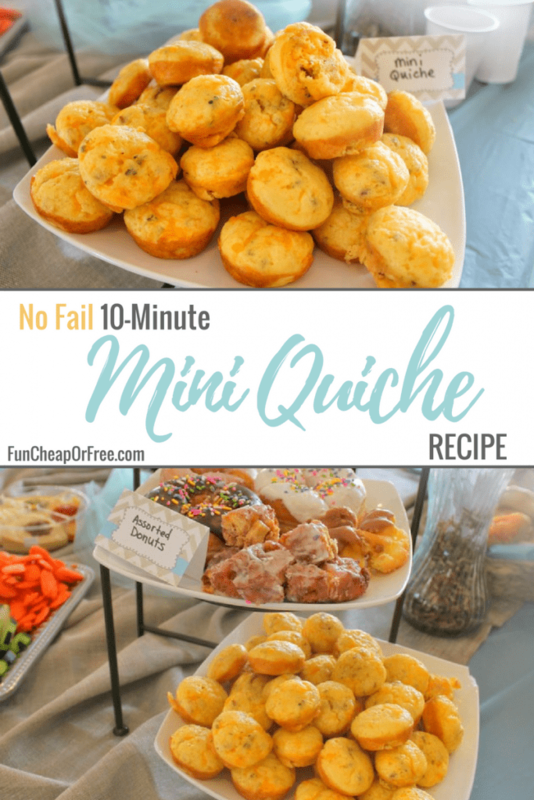 Cheap Party Food Ideas – I'm including a huge list of party food ideas that you can use as a resource. Shop for your Party – These tips for shopping will help you stay on budget. Party Accessories and Must-Haves – Check out what I use regularly when I host and entertain the masses. Pssst…. don't want to read the whole post? Just click on the section you're curious about and we'll take you there! *Don't forget to check out my Studio 5 segment for details about feeding a crowd in the summer! If you are hosting a graduation party at your house and plan to invite all your family and friends… I wouldn't recommend serving steak. That would become an extremely expensive party! However, if you are hosting a dinner party with 2 of your best couple friends then sure, steak is a little more reasonable. Here is a great resource for finding out how much to make per person you will be serving. TIP: Always ask for an RSVP by a certain date so you can get an accurate number. Doing it via text, facebook, or email will get you the most results. People hate having to call! What Time Is Your Party? If your party goes from 9:30-11am, that would mostly fall under the “light snacks” rule. A later party from 6pm-8pm, mostly falls under the “full dinner” rule. 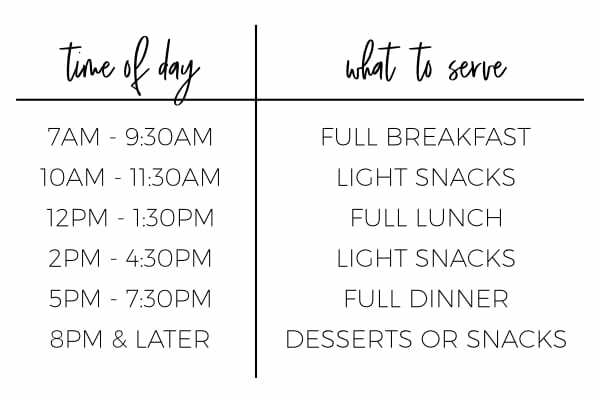 If your party is from 11:30am – 1pm, that mostly falls under “full lunch” rule. See how that works? Another thing to keep in mind with time of day is that people will eat and drink more at night than during the day, so plan appropriately. 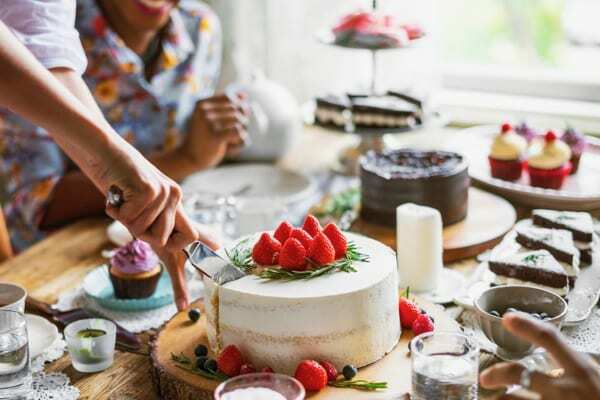 Take a dessert party, for example, if you have more variety of desserts, people will eat less of each and will be satisfied with smaller bites. If you have a dessert party with 3 cakes and nothing else, you should cut big slices and expect them to be wiped out. But if you have smaller cakes, cookies, pastries, cake bites, brownie bites, and other small things, you can serve less of each and make much smaller portions because there is more variety. See how I did this super easy cake-mix dessert party HERE. What Is Your Party Budget? With anything in life, setting a budget is key. Decide early what you are willing to spend and base your menu around it. 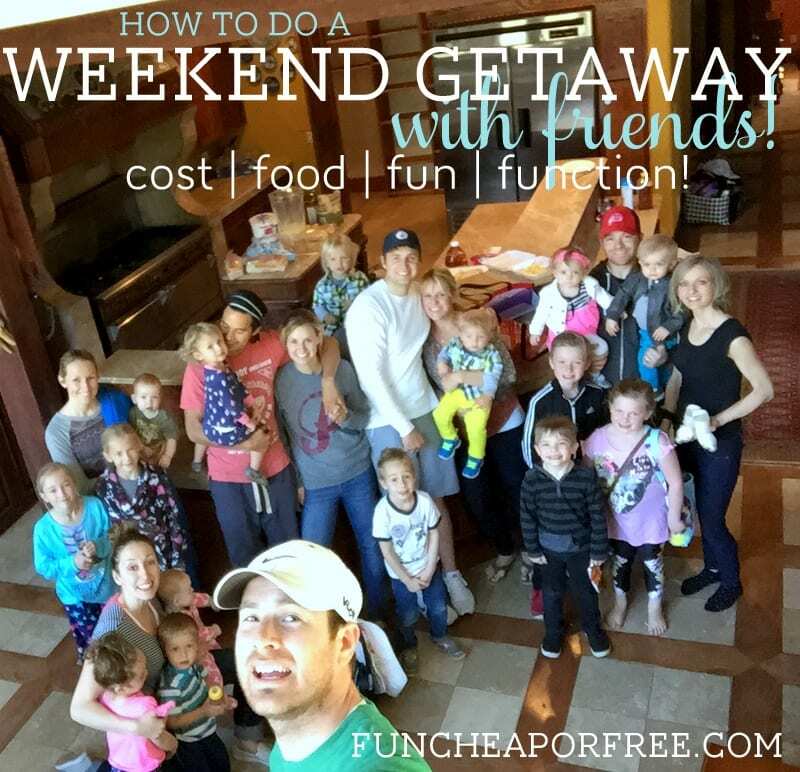 Believe it or not, it's quite easy to do a party for cheap or even free. Potluck, BYOM BBQ, dessert party, even a pasta party all can be done for only a few dollars. If there are going to be lots of kids at your party, avoid dark-colored punch, soups, and meals that could cause a mini disaster in your house. If people will have a table to sit at, soups and taco salads are fine to serve. If people will mostly be standing and mingling, finger foods are best. If it's something like a family reunion, consider a menu that has something for everyone, something that everyone from little kids to seniors would enjoy. For a bachelor party, I probably wouldn't do a salad bar… maybe stick more to a hearty BBQ. Having a baby shower? I'd avoid chicken wings and focus on a lighter menu. Just keep your attendees in mind so the food is fitting! Baked potato bars, soup bars, and pasta bars are perfect for winter months. Salad bars and BBQ's are perfect for Spring and Summer. Potlucks are great all year. Just consider what's in season, and what time of year it is. A lot of these ideas are classic! These are foods that people love, and the best part is that they can be cheap if you plan right! Another bonus – a lot of them will also work for lunch time. 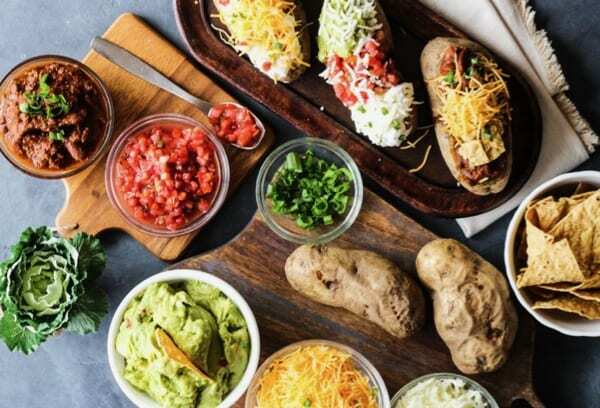 Baked Potato Bar – Baked Potato bars are a wonderful party food idea! Potatoes are cheap and easy to prepare in advance. Just bake your potatoes straight in the crock pot (instructions HERE) and you can keep them warm and serve them straight from the same pot. Have a variety of toppings to choose from. Picture credit and tips here. BBQ – This is a favorite for summer months. You provide burgers, dogs, or other shredded meat of choice, plus buns and condiments. Have your guests bring a side, drink, or dessert to share. BYOMeat BBQ – You provide the grill, sides, buns, condiments and drinks. Everyone else brings their own meat and even a side to share. You offer to cook everyone's meat or let them do it themselves to their liking! 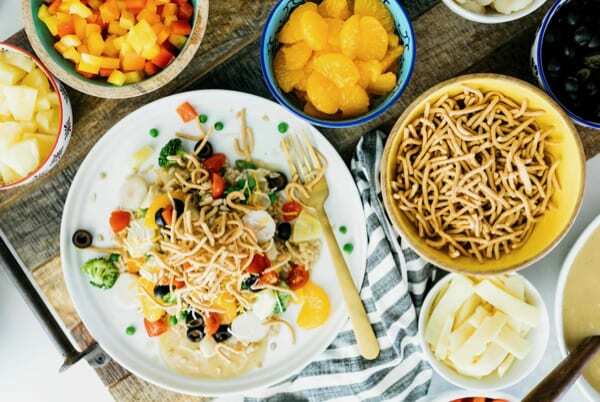 Hawaiian Haystacks – These are so easy and delicious, plus easily adaptable for people with allergies. Provide everything you need to create a Hawaiian Haystack and ask your guests to bring a side, dessert or even a Haystack topping. Plan in advance to avoid too many duplicates. Picture credit and more tips here. Pasta Bar – For a very filling dinner party, pasta is an excellent choice! Provide a few types of pre-cooked pasta, sauces, and toppings. Ask guests to bring breads or green salads. Avoid if children are at your party, unless they will be seated at a table. See how I did this easy pasta bar HERE. 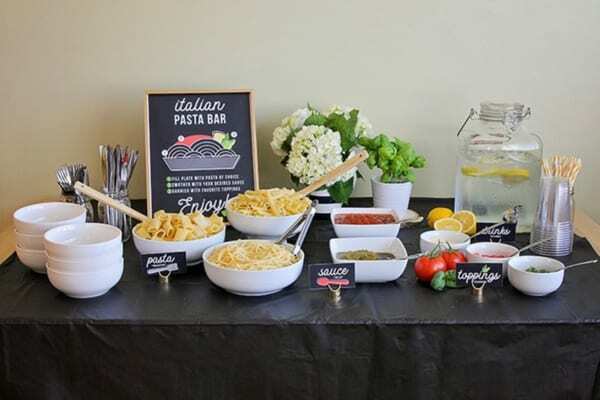 Or check out this adorable pasta bar from Somewhat Simple. Taco Bar – Who doesn't love a taco? You provide everything you would need to build a taco. Ask guests to bring a side or dessert to share. Potluck – The most inexpensive party idea is a potluck, but it does require a bit more planning. Provide the drinks and a dish or two. Have everyone else contribute a dish, as well. You can ask for specific dishes – main, side or dessert. Salad Bar – Have everyone bring a salad to share or provide different kinds of greens and have everyone bring a salad topping and build their own salad, like a conventional salad bar. Provide drinks, breads, soup, mini sandwiches, or some other side. 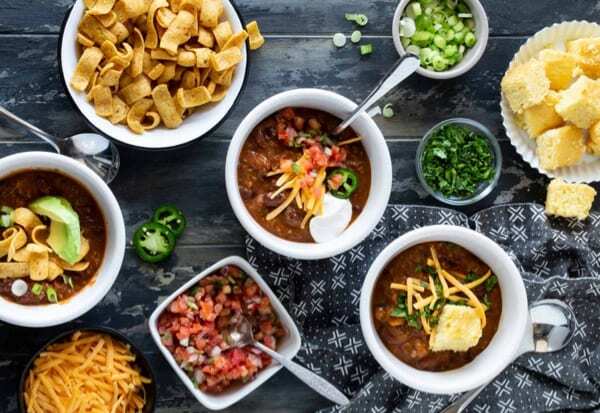 Soup or Chili Bar – This is great for winter months. Avoid if children are at your party or if guests will not be seated at a table. You provide the soup and soup toppings. Ask your guests to bring a side, dessert or toppings. Plan in advance to avoid duplicates. Picture credit and more tips here! If your party can be turned into a brunch, you're in luck because you can mass produce all kinds of brunch foods for cheap. And people love breakfast foods. Make Your Own Parfaits – You'll need a whole lotta yogurt for this one, plus some granola and fresh fruit! That's it! You can even make your own giant batch of granola to save a little $$. Tips and picture credit here. Waffle, Crepe or Pancake Bar – This is one of my favorite fun group meal ideas. Toppings can include everything from yogurt, ice cream, and chocolate syrup, to peanut butter, Nutella, and chopped nuts. Bagel Brunch – This is such a unique idea that bridges breakfast and lunch perfectly. 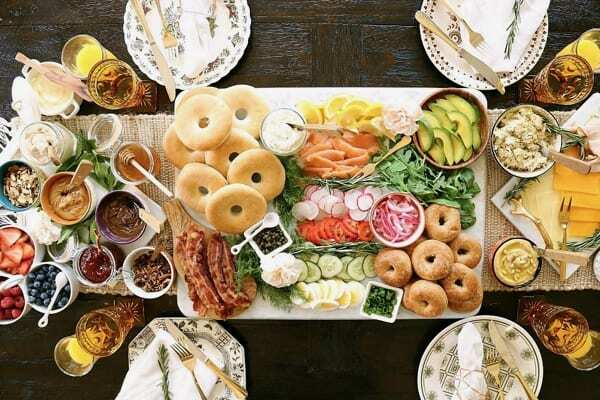 Check out this amazing Bagel Brunch from Celebrations At Home Blog. Breakfast Sandwiches – Make a bunch of breakfast sandwiches. These are easy to make in an assembly line, so grab some helpers. 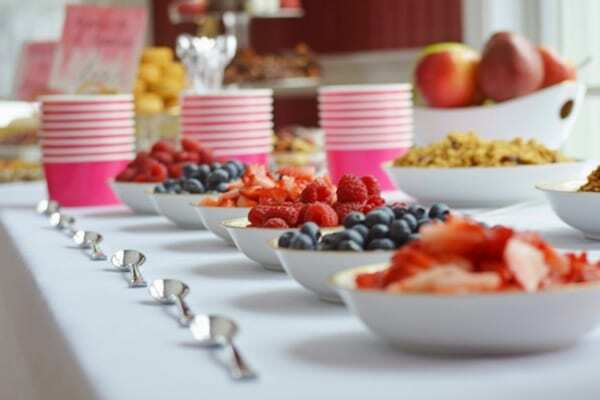 Have guests bring fruit, pastries or other yummy breakfast or brunch foods to share. French Toast Casseroles – Make a casserole or two and invite guests to bring a French toast casserole to share. There are so many ways to mix up snacks and have a super fun party! The sky is the limit. Here are just a few ideas to get you started thinking. 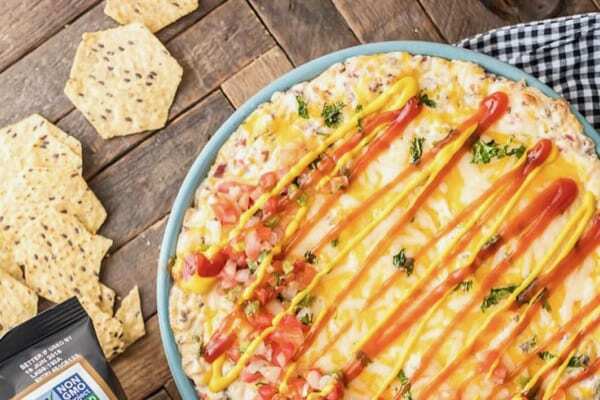 Dip Party – Ask everyone to bring a creative dip (this Bacon Cheeseburger Dip would be a hit) to share, you provide all the dipping items. Or you provide the dips and have your guests bring items to dip! Cheese fondue anyone? Finger Foods – Yum! These are the best party foods out there. You don't have to worry so much about utensils, since the goal of finger foods is to contain the mess and eat with your fingers! Sliders – Quick, easy, versatile party food that everyone loves! There are so many good recipes out there for amazing party sliders. 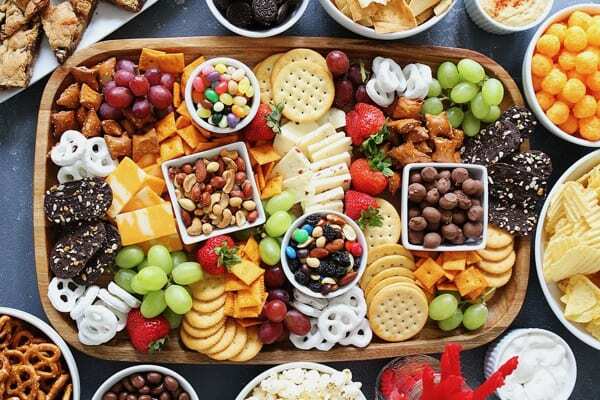 Snack Boards – Everyone loves a cheese board! Add some more fun to your cheese board to make the ultimate snack board. This is such a unique idea and makes it easy for everyone to contribute a snack and throw it all out in bowls or on boards. Check out some more ideas from Two Peas And Their Pod. Favorite Appetizers – Have everyone bring their favorite appetizer! Then you'll just need to provide drinks and a few of your own favorites! Great for late-night get together's. Provide drinks and a few main desserts, as your guests to bring a dessert to share. Toss in a veggie tray for the healthy eaters. Ice Cream Sandwich Bar – A giant batch of cookies and some ice cream go a long way! 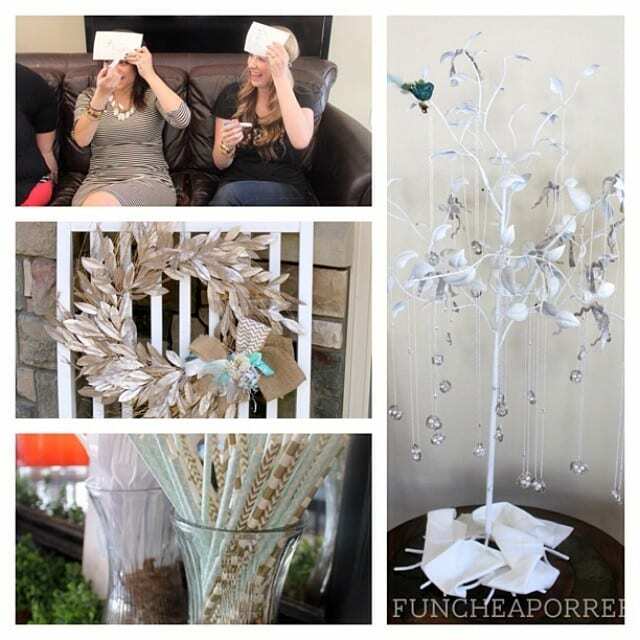 Check out this gorgeous, inspirational party from The Tomkat Studio. Brownie Bar – Start simple and just have everyone bring a brownie or bar to share. So yummy and easy! Build Your Own Sundae Bar – Grab a couple gallons of ice cream – the more flavors the better. Ask everyone to bring their favorite toppings like fruits, nuts, sprinkles, chocolate syrup, whipped cream, etc. Don't forget to have a few of the basics on hand! 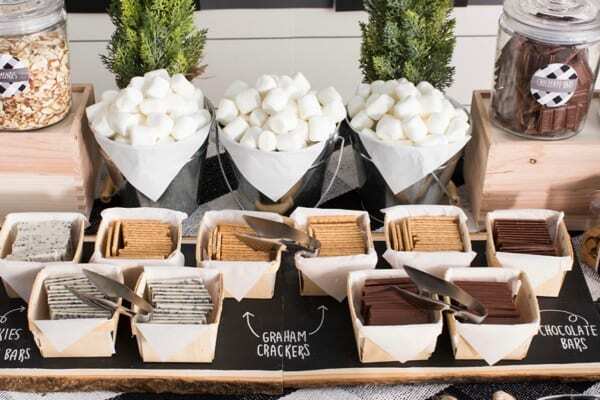 S'mores Party – This is the perfect idea for summer and lounging around with friends. It's a perfect party food idea! Picture credit and tips here. Popcorn Bar – Talk about easy and cheap! Popcorn is super cheap and mix-ins are easy! Cookies – Wanna keep it simple? Just make a giant batch of cookies and invite everyone to bring a batch of their favorite cookies. There will be plenty to go around and everyone will get something they love. For a printable version of this list plus all the topping and food ideas, click HERE. Remember…even the simplest (and cheapest!) meals can be delicious and a crowd pleaser. See “how I grocery shop” for a full rundown on how I save 1/2 on my groceries (without clipping coupons!) . Throughout the year, watch the sales! If you see condiments go on sale, stock up. Same with chips, paper plates, napkins, drinks, and other pantry items. This also goes for anything you can freeze (cheese, tortillas, meat, etc.). Before running to the store, open your fridge, freezer, cupboards, and pantry and use what you have! This goes for decorations, too. Trust me…you'll save A TON of money if you simply get creative with what you already have. The week of your party, keep an eye on the ads and use it to influence your menu. I use www.dealstomeals.com to see what's on sale in my area that week, and to print a shopping list straight from that site. Regardless of how you do it, just keep an eye on the sales for that week. If Coke products are on sale that week, buy those instead of Pepsi products. If Heinz ketchup is cheaper than Hunts, buy Heinz. That alone will save you TONS. Buying bulk will save you tons of money when cooking for a crowd! I prefer shopping at Costco, personally, but even grocery stores have bulk sections. See my list of things that I buy from Costco HERE. I avoid buying cutesy plates and cups, they are WAY more expensive. Rather, I stick to the bulk plates and cups and dress up my party in other ways. See below for ideas. Be smart. Plan ahead. Don't go crazy. Check out tons of my party ideas, shower ideas, and hostess ideas while you're at it! Now, you don't have to go crazy with it, but just incorporate it here and there to tie it all in together. Whether it's with little decorative pieces, invitations, food labels, napkins, table cloth, candles, or with the food itself, bringing a pop of color in can bring your gathering to the next level. For a dessert party I threw I had yellow and green as my accent colors. To tie the colors in I simply placed different sheets of 12×12 scrapbook paper under some of the dishes. You can also use tissue paper and wrapping paper for this. And yes, you can use the paper for future projects! This is an inexpensive way to dress up a gathering. Lately I have been buying my cute napkins from Ikea. Look at how adorable they are! I love them because they are BIG (sometimes party napkins are itty bitty), and are super sturdy. They are affordable, too.They are $1.99/pack for 30 of the smaller printed ones, and $1.99 for a 50 pack of plain colored ones (see here). An amazing crockpot is always a must when serving a crowd. You can cook and serve right in the crockpot, so it cuts down on dishes and mess! I have two different electric serving warmers and I'm OBSESSED! I got one for Christmas a few years ago from Costco. It's perfect for food that you've made in advance, and want to keep warm. I got this one last year for Christmas. I love it because it's 3 individual crock pots that actually cook, which makes for easy clean-up since I'm doing everything in the same pot. These are the handiest tools EVER for feeding a crowd. They save space, keep your food warm, and look nice and professional. They are pretty affordable. I recommend keeping your eyes peeled and buying them AFTER Christmas when they go on sale. It's an investment that you will be able to use over and over! I even use these for our Sunday dinners. This is not only an easy way to dress up your gathering, but will also protect your furniture. I have had luck buying them at Home goods for $5. I like the vinyl ones that are easy to wipe down, but I also have cloth ones that I can throw in the washing machine. Once again, it's an investment that you can use over and over. Keep in mind that you can also use a roll of wrapping paper down the center of a table as a disposable runner! I also like the cheap table cloths from the Dollar Store, because you can toss them guilt-free. No need to buy any fancy ones from Etsy or other shops. They are simple! You can even make them on Word! 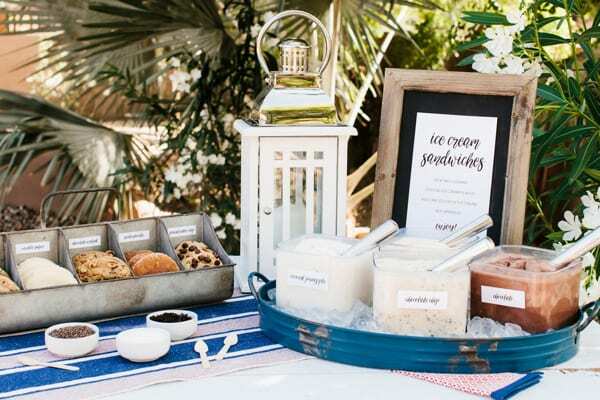 Labels add cuteness and creativity to a gathering, but are also really functional – especially for dessert parties so people can know if there are nuts in the dessert they are about to eat. Cupcake stands are a nice way to save space. You can buy these especially cheap at craft stores using coupons. Remember, Joann Fabrics accepts competitor coupons! I bought a birch Lazy Susan table from Ikea for $7.99. This is SUCH a great tool for condiments! People can spin the table, grab what they want, and it doesn't take up much space. 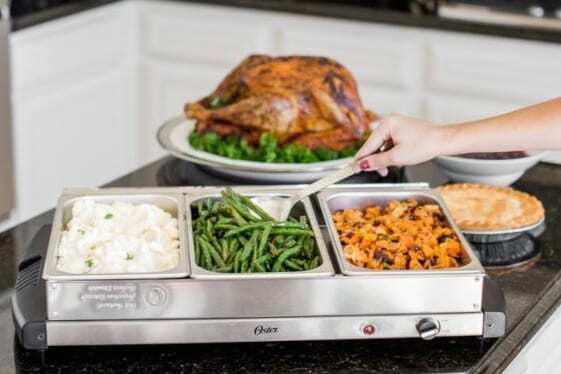 It looks neater, and helps people get what they need without reaching over all the food. Don't Forget – Use What You Have! 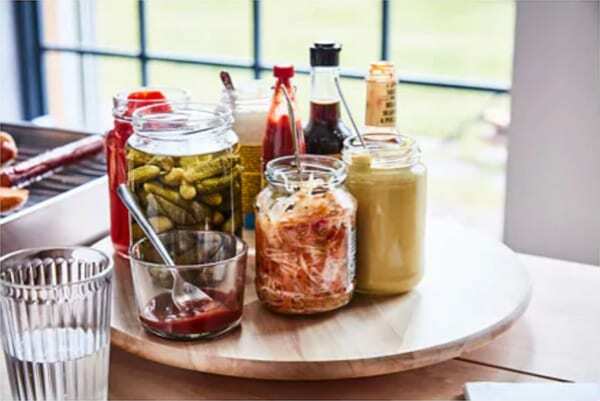 I love using baby food jars or leftover tupperware to serve sauces and toppings. Wrap a cute ribbon around them, put a label on or next to them, and there you go. I save and re-use plastic baby food containers (the Walmart brand). I LOVE THEM because they are like tiny tupperware. For my potato bar, I prepared the toppings ahead of time, stacked them in the fridge, then pulled them out when it was time to start the party. I used colorful baby spoons because they are the perfect serving spoon size. Serving Platters, Plates, and Dishes. The dishes you use to display your food can really make a statement at a gathering. The good news? There are TONS of ways to get inexpensive platters and dishes! Thrift stores, dollar store, Target, Walmart, clearance, and even getting creative and making some yourself. I made a stand out of Dollar Store items and glue, see how here. I get TONS of DIY project ideas from Pinterest. I got this tiered stand as a wedding gift and have used it probably a million + 1 times. Buy a functional piece for a good deal, and you will use it over and over. This stand looks like it would be perfect for so many types of parties! Great investment! My MIL bought me an amazing picnic caddy from Costco one year and I use it for EVERY SINGLE gathering we have. 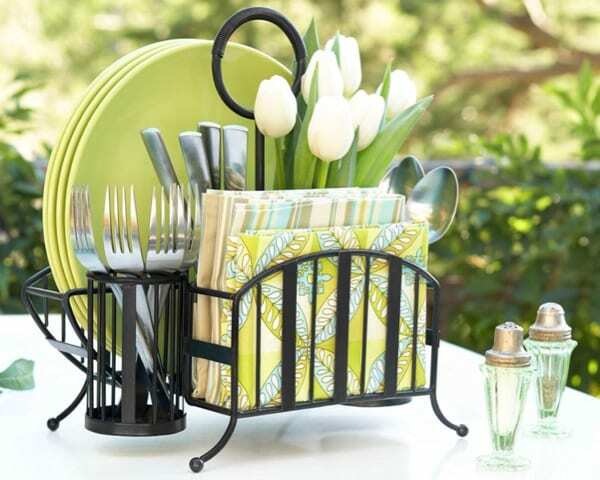 I love it because it avoids having to stack things (plates, napkins, silverware), keeps things neat and organized, and takes up little counter or table space. I absolutely LOVE my center-folding plastic table I got at Costco. They sell them online for a little under $90, but I'm pretty sure I got mine for much less in the store…maybe $50 or $60? Costco's plastic utensils are THE BEST. They are so sturdy, I actually toss them in the dishwasher and use them again! But, if I'm outside (like at a family reunion or picnic) then we can toss them, guilt free. They always have coupons for them too, so stock up when they go on sale. 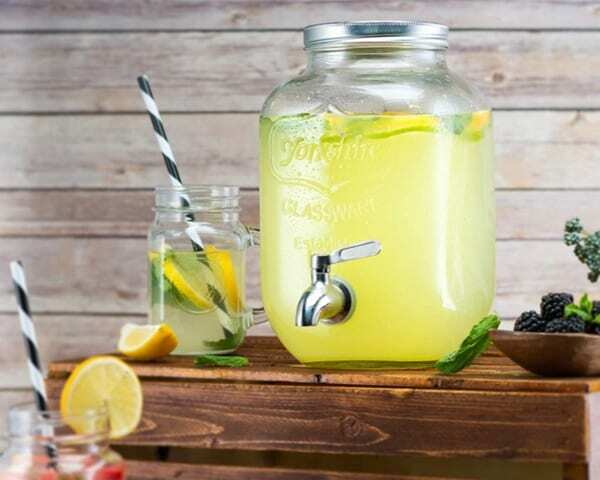 Ideas for serving water at a party – dress it up! Rather than serving fancy, expensive drinks, give your water a face-lift! Slice up fruit to make flavored water. Put your water in a cute pitcher. Dress it up with fancy ice cubes. All easy ways to serve a nice drink…for cheap or free. Ikea has great ice cube trays for $1. The black tray is really cool because it creates ice cube rods that you can put in water bottles! You can make a neat display out of these for people to put in their cups. Take fruit that is bruised or on it's way out, and freeze it. When it's time for a party, break up the fruit and freeze it in your ice cubes. How fancy is that?! I prefer serving my water in a large dispenser so I don't have to keep filling it up throughout the party. I shopped around for one for a year or two, then finally settled on a $17.99 pitcher from Costco that has been fabulous. When I want to serve something other than water, I often go the easy route and buy a case of water bottles or serve soda in the can. That way I don't have to worry about spills and cups. I keep my eye on soda all year and stock up when it goes on sale. So there you go! Wow, this was the longest post ever. Hopefully now you have all the tools you need to have LOTS of gatherings this year… on the cheap. Remember, even the cheapest and simplest meals can make for an unforgettable party with a little creativity and a lot of love. Click HERE to watch my Studio 5 segment online. Ps Did you like this post? If so please subscribe to my newsletter list so you don't miss another one! If you’re new here, welcome! You can get all budgeting and finance tips, and my secret sauce in my fun-to-watch video program Budget Boot Camp! You have nothing to lose because if you don't save or earn at LEAST what you paid for it, I'll give your money back. So use the code FCFBLOG at checkout to get an extra 10% off, and give it a try! Thank you! My son wants a taco bar/pasta bar graduation party. This gives me a start. Now I just have to try to figure out how much to cook. Thank you so much!! This truly helps a lot, what do you think of a hot dog bar, and buying different condiments? OOH! That would be fun! You could do gourmet hotdogs and sausages for the adults and standard hotdogs for kids, with all sorts of toppings. That’s a fabulous idea! Awesome post! Great tips! I want to do a lot of these things and buy a lot and use things I have. Thanks for sharing your awesome ideas! AWESOME post Jordan!! I also use a water dispenser for either water with sliced fruit or cucumber, or ice team. Saves a lot on buying bottles of water or ice tea and it looks great. I bought a yellow deli style plastic bottle for mustard and red one for ketchup from the Dollar Tree. I fill them up with whatever mustard and ketchup are on sale, it looks cute and avoids the kids asking for their favorite brands lol! That’s very helpful menu concept and ideas! Thank you for sharing! I don’t usually prepare baked potato but it seems very useful in the party. I’ll take this one. Oh wow, I needed this! I need to try and pull off a 30th birthday party for my husband – but we’re still in our FD – I will be trawling all your blog posts for tips! Thank you!!! Appreciate your time and sharing your expertise!!! This list was awesome thanks for sharing such a great list as it truly helps me a lot in making such a great food for my relatives and beloved ones on the occasion of my birthday event and the food is very tasty and delicious to eat. Catering seems really difficult and kind of expensive. I liked that you pointed out that doing a pasta bar could be a very cheap way to cater for a lot of people. That is great for me to know because I am going to try to help my sister find a good caterer for her wedding.